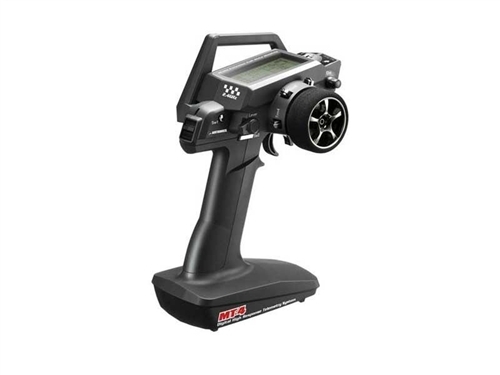 The Airtronics MT-4 4-Channel 2.4G FHSS-4 radio control system is the first 2.4G pistol grip radio to provide telemetry, industry leading latency, SSR (narrow pulse-width, super fast servo response) compatibility and 4 channels with advanced programming, all in one ultra-lightweight, comfortable case. The feature set of the MT-4 is like no other radio in our hobby today. When used with the included Airtronics RX461 (92010) FHSS-4 receiver, real-time telemetry tells you what you need to know when you need to know it. In addition, the MT-4 supports the Airtronics FHSS-2 and FHSS-3 modulation types, so it will work with any Airtronics 2.4G FHSS-2 and FHSS-3 surface receiver as well (just no telemetry of course). This means you'll have your choice of affordable aftermarket receivers and high-performance ultra-fast racing receivers to use with the radio. And, all of this is packed into a new ultra-lightweight comfortable case that features an integrated antenna, adjustable grips, adjustable steering and an adjustable trigger. Whether you're racing at a world-class level, rock crawling over the most complicated courses, or just bashing in the backyard, the MT-4 will do what you need when you need it. Transmitter Batteries: The transmitter requires 4 'AA' Alkaline batteries. Conversion to rechargeable batteries is easy and affordable using Ni-Cd or Ni-MH cells and the Airtronics 95034 110V AC Dual Charger. Alternatively, the transmitter can be powered using a 2S LiPo or 2S A123/LiFe battery pack. DO NOT USE A 3S Li-Po! Receiver Battery: The receiver's Nominal Input Voltage is 4.8- 7.4v, therefore, the receiver can be powered using a 4- to 6-Cell NiCd or NiMH battery pack or a 2S LiPo or 2S A123/LiFe battery pack. DO NOT USE A 3S LiPo! Servos: No servos are included. Analog or Digital servos can be used. We recommend using Airtronics Digital servos that are within the specification range required for your model.